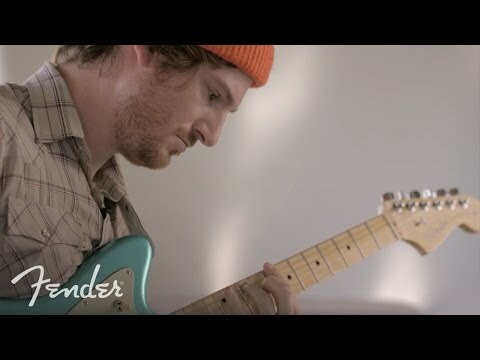 The Jazzmaster was first introduced to the world in 1958 to appeal to jazz musicians, but over five decades later and the Jazzmaster now attracts guitarists of all genres and walks of life. Fender applied a unique offset body design to the Jazzmaster which was originally an enticing feature for musicians who would prefer to sit down while they played. The 2017 American Professional edition retains the historic Jazzmaster style and shape with the addition of some new appointments to entice the modern guitarist. The Jazzmaster has a slightly larger body frame in comparison to Fender models released in the 50s, and its unique offset-waist body was completely new at the time of its release. The American Professional Jazzmaster keeps this traditional, ergonomic shape, offering an incredibly comfortable feel against your body. Alder is employed to construct the Jazzmaster body, known for its lightweight feel and very well-balanced range of diverse tones. The American Professional Jazzmaster model has been securely fitted with a 25.5 inch scale length redesigned maple neck which is shaped to the new Modern "Deep C" profile. The new neck profile feels just right in your hand as you make your way up and down. The neck is also topped with a smooth 9.5 inch radius maple fingerboard which is an exquisite playing surface using a favoured Fender material. The fingerboard hosts 22 narrow-tall frets adorned with black dot inlays, so performing string bends and chord structures comes naturally. The pickups on the American Professional Jazzmaster have been expertly designed by a master, Michael Frank himself. Frank is known for developing the Eric Johnson Signature Stratocaster pickups, and he has now come up with the wonderful V-Mod single-coil Jazzmaster pickups. These soapbar-style single-coils are packed with a punch, producing beautifully versatile, vintage Jazzmaster tones. A new treble-bleed tone circuit is just another of the innovative features of the American Professional Jazzmaster. By tweaking the Master Volume control knob this maintains those singing, crystal clear high-end tones without compromise. The additional Tone control adds definition to the Jazzmaster sound, and a 3-way pickup toggle switch allows for alternate pickup configurations. For unsurpassed intonation and sustain, Fender have employed a 9.5 inch radius Jazzmaster/Jaguar bridge with brass Mustang saddles to sit at the lower bout of the body. This is accompanied by a vintage-style floating tremolo, a tremolo lock button and screw-in tremolo arm. The tremolo lock button, along with a bone nut and reliable Fender standard cast/sealed staggered tuning machines ensure that your strings always remain firmly in tune, even after heavy use of the tremolo arm. Nickel/chrome hardware complement the beautiful body, along with white "witch hat" control knobs and a protective 3-ply pickguard to prevent scratches. The 2017 American Professional Jazzmaster comes with a Fender Elite molded case for safe storage and transportation.